Glutathione depletion is a natural aging process. Normally, our body's glutathione levels fall starting at age 20. And it falls at around 10% per decade or 1% per year! When you are sick, our glutathione reserves can decrease more dramatically! What causes the falling down of our glutathione levels? 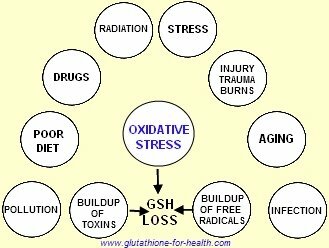 Stress, Injury, Trauma or Burns, Aging, Infection,Buildup of Free Radicals, Oxidative stress, Buildup of toxins, Poor diet, Pollution, Drugs, and Radiation all contribute to the fall of our body's glutathione levels. To prevent further decrease of our glutathione levels, we must boost our body's ability to manufacture this master antioxidant. We can do so by eating foods rich in glutathione or one of its precursors. Or we can take a glutathione supplement scientifically proven to raise blood glutathione levels.